Endangered medicinal and aromatic plants, people collecting them and communities relying on them are expected to benefit from the release this week of a revised standard for their environmentally sustainable and fair collection and trade. Weinfelden, Switzerland: Endangered medicinal and aromatic plants, people collecting them and communities relying on them are expected to benefit from the release this week of a revised standard for their environmentally sustainable and fair collection and trade. The new standard combines the essential provisions of two existing standards – the 2006 FairWild Foundation standard for fair trade in medicinal and aromatic plants and the International Standard for Sustainable Wild Collection of Medicinal and Aromatic Plants (ISSC-MAP), issued in 2007. “Application of the revised FairWild Standard will ensure that medicinal plants are sustainably managed and harvested, and that those involved in collecting and trading them receive a fair deal for their knowledge and efforts”, says Bert-Jan Ottens, Board member of the FairWild Foundation responsible for Communication and Marketing. Globally, more than 400,000 tonnes of medicinal and aromatic plants are traded annually, with the great majority of these species harvested from the wild. Out of the 50–70,000 plant species used medicinally world-wide, around 15,000 are thought to be threatened by over-exploitation and habitat loss. The latest FairWild 2.0 Standard was drawn up following extensive consultations with plant experts and representatives from the global herbal products industry and draws on experience with the original standard. "collectors often belong to the poorest social groups in the countries of origin"
It aims to maintain wild plant resources, prevent negative environmental impacts from collecting activities, respect customary rights to plants and ensure benefits to local communities and require fair treatment of collectors, including limiting the use of child labor. “As a major manufacturer of herbal products for the global market, the benefits of being part of a scheme to ensure sustainable supplies of our core ingredients are obvious,” says Josef Brinckmann of Traditional Medicinals. The company currently markets products ranging from Just for Kids Organic Nighty Night® Herbal Tea to Organic Throat Coat® Herbal Tea that contain FairWild certified ingredients. According to Heiko Schindler of the Institute for Marketecology (IMO), a certifying body for the FairWild Standard, the global herbal products industry has been more than enthusiastic in adopting the principles of the FairWild certification scheme. “This year, 23 wild plant collection companies in thirteen different countries are on track to becoming FairWild certified”, he comments. The FairWild Standard is useful not only for companies wishing to certify their products as sustainably traded. Earlier versions of the Standard are already being used by Government agencies in a number of countries as the basis of their natural resource management plans, thereby helping to fulfil their commitments to the Convention on Biological Diversity. Partners in the FairWild Foundation include The Swiss Import Promotion Programme (SIPPO), the International Union for the Conservation of Nature (IUCN), WWF and the wildlife trade monitoring network TRAFFIC. 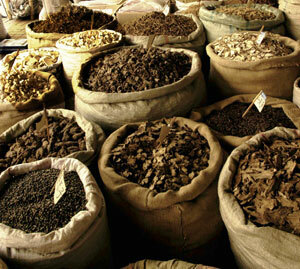 Medicinal plants' market. Chengdu, Sichuan Province, China. The harvesting of plants for traditional Chinese medicines can disturb panda habitat and has caused the extinction of some local plant species in the Minshan Mountains.